Just a few options it shipped with: 4WD, dual exhaust, full size bed, quad front shocks, 8600GVW, antenna integrated in windshield, a 160hp/250tq 350ci v8, HD cooling system, tow package, power windows, power locks, chrome bumpers, dual gas tanks, 4.10/4.11 gears, 14B semi-floater rear differential, blue on blue exterior with blue interior. Anyhow it's paid it's dues over the years. But now it's time to start paying it back. Currently has over 300k miles on it - hard miles that include towing in tandem a camper and 38' travel trailer. 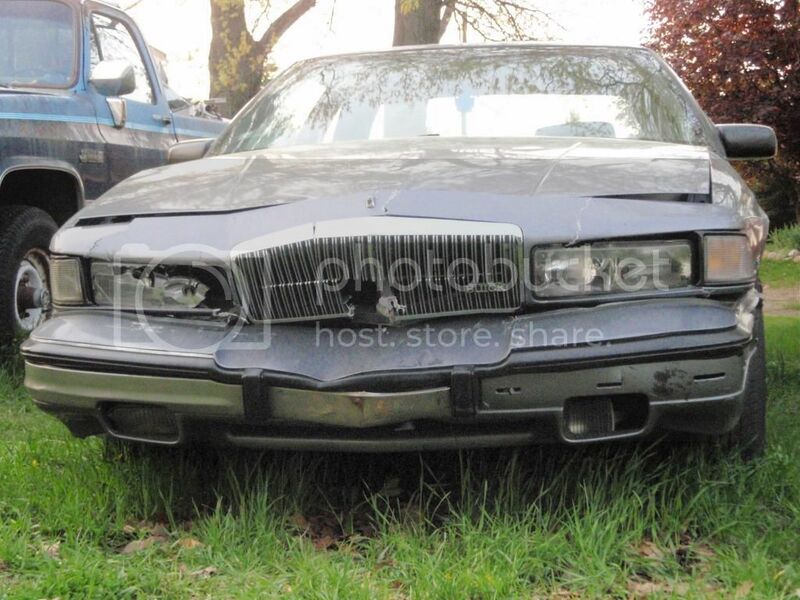 Since the original 350 died, it's had an Olds 455 and two Buick 455 motors under the hood. It's on it's 4th or 5th trans and second transfer case. 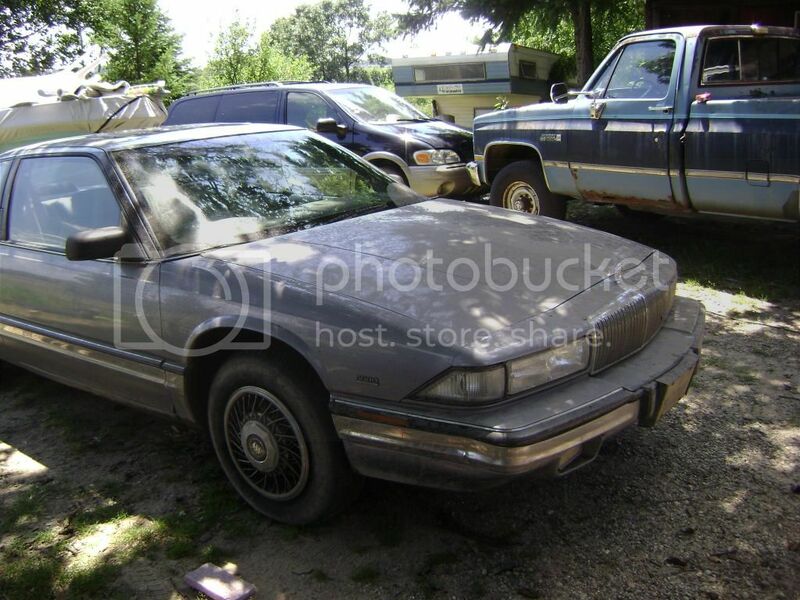 Long term goal for this project: Full restoration with a Northstar V8 and some turbo love. With any luck that will happen later this year. 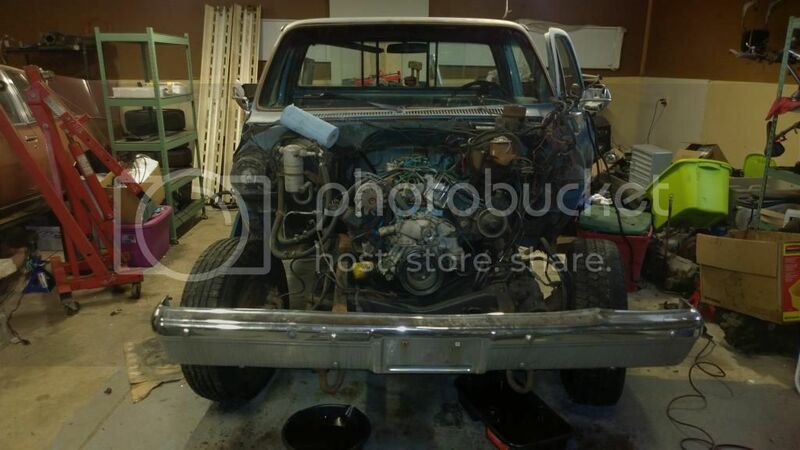 Parts for this truck are still mostly available, so should limit the amount of welding that needs to happen. 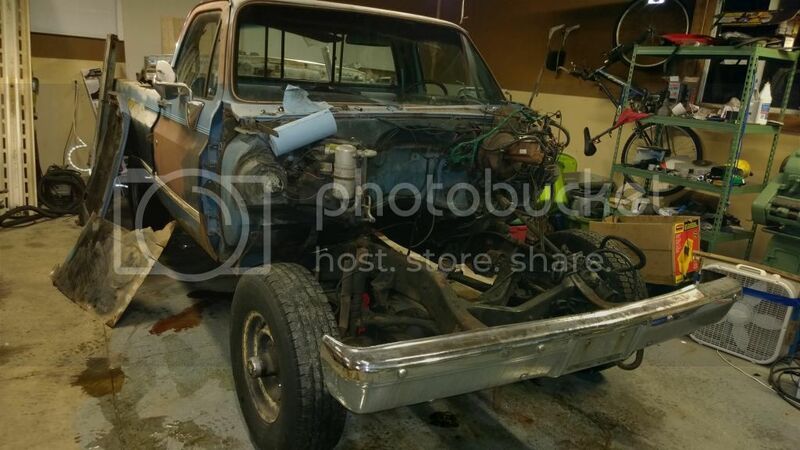 What I'm going to be doing now: 3800 swap, exhaust repairs, body mount rust repairs, new ball joints and tie rods, new fuel tanks and lines, new brake lines, and rear disc brakes. This should get me back on the road for winter. A little history on the 455: It was bought in 2013, reconditioned, and replaced the 455 that my wife ran in 1st gear at 45mph for about 2 miles before that one spun a bearing (she knows I'm never going to let her live that one down). I'm pretty sure with the gearing it had that was around 6400rpm on a motor that normally redlines at 5000. It has the high compression heads and a late Olds 455 Q-jet. I did all of the recommended oiling mods and it was running fairly well other than the secondaries on my Q-jet sticking shut all the time. Then one day it started randomly misfiring for a short duration, corrected itself shortly thereafter, and was fine the rest of the day. Next day did it twice. Third day I headed off to replace the cap, rotor, coil, all of which were years old, and it started misfiring and wouldn't recover. It got worse, and started making a random metal on metal clanking noise. Of course, the ignition components didn't correct the issue, so I called it quits and towed it home. 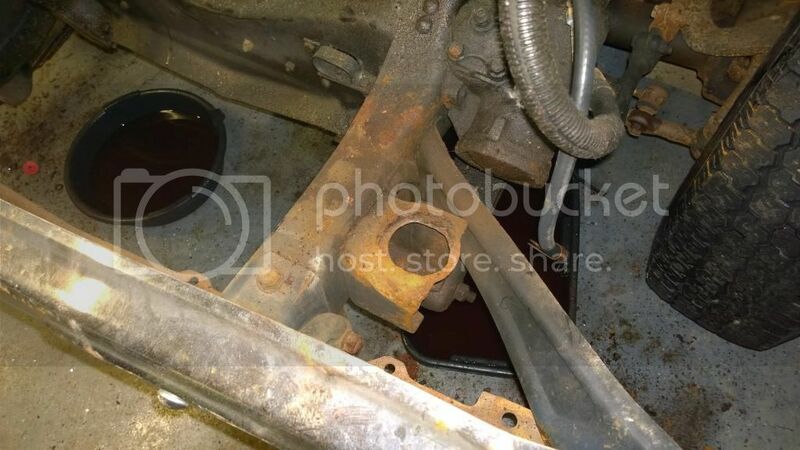 Further inspection revealed metal in the oil. 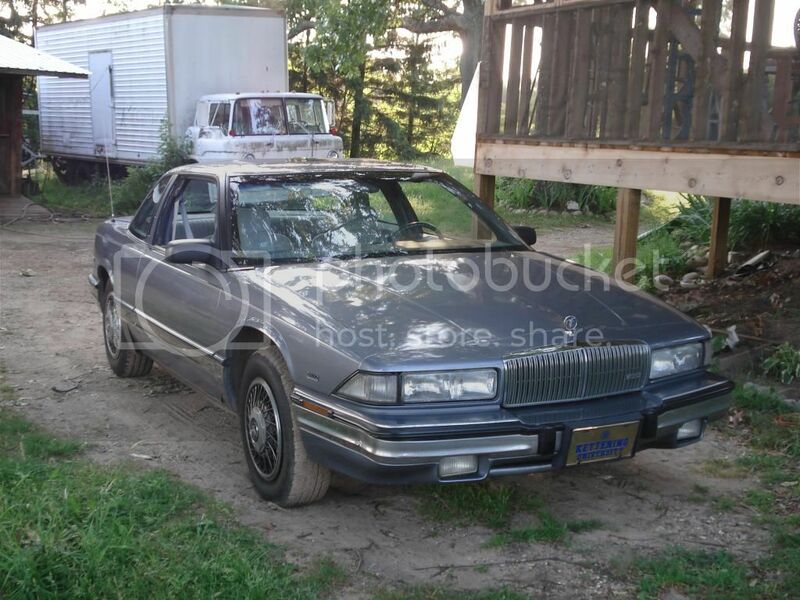 The 3800: Started life out in a '91 Regal that we picked up for $600. 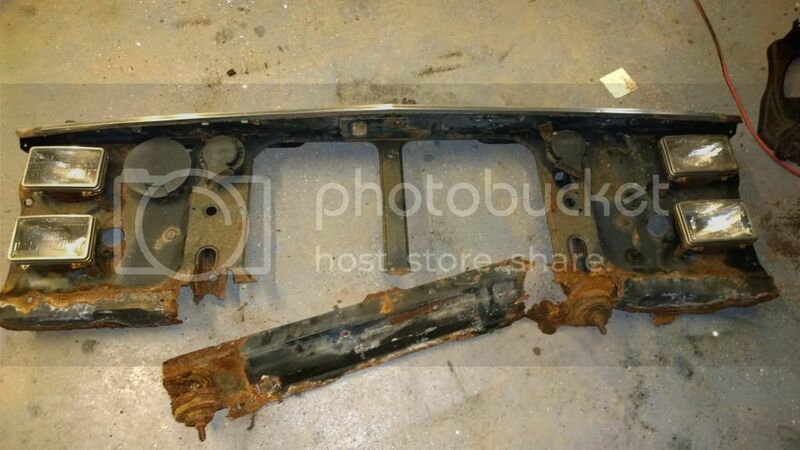 That car had the typical rear-end sag due to rusted out mounts for the rear swing arms. It was poorly bondo'ed everywhere and a true beater of a car that pretty much everything worked perfectly on. Coupe, sunroof, and the euro cleared tail lights, concert sound with steering wheel controls, and the most comfortable seats ever. A few years back, somebody pulled out in front of my brother while he was driving it and he rear-ended them. At that point it just wasn't worth the money to fix it up. We pulled the motor and trans, scrapped the car. The drivers seat is still in use to this day, setup as a computer chair with all the power functions still operational. The trans, 3.06 FDR, was donated to my LeSabre prior to the L67 swap, and this 3800 was converted to RWD for my brothers G-body Grand Prix. It was mated to a S10 700-r4 that we picked from a junkyard. He didn't get to use it much before deciding to have some real fun with that car, and stripped it down last summer. Motor has somewhere near 160k miles on it, so plenty of life in it still. Excited to see this thing take shape. 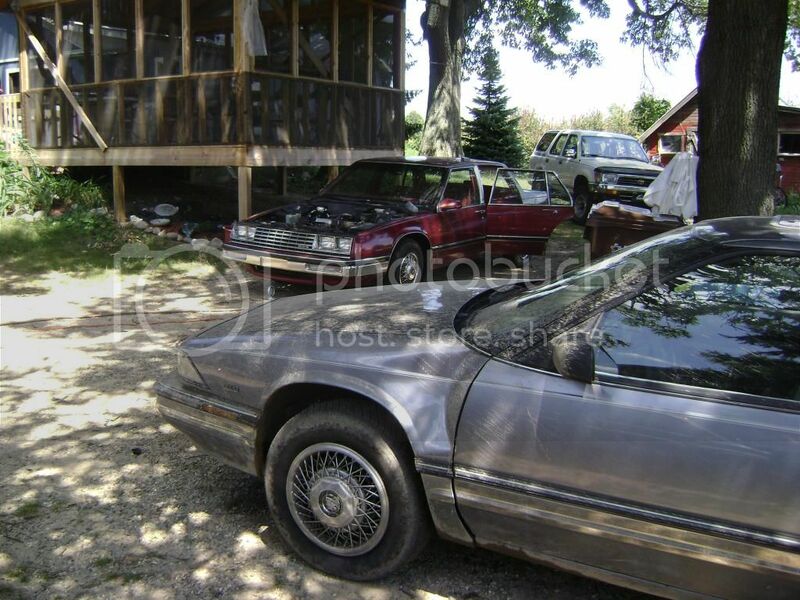 And here it is with Matt's 86 Lesabre pre-L67 swap. That thing was definitely the most reliable car I've had, save for being a complete beater. Holy crap a blue Michigan plate, that is an old picture. yepp, they switched to white shortly after that. Hard to believe this was that long ago. What's up with its tail lights? Never seen one like that before I don't think. Looked nice! It's actually factory believe it or not. 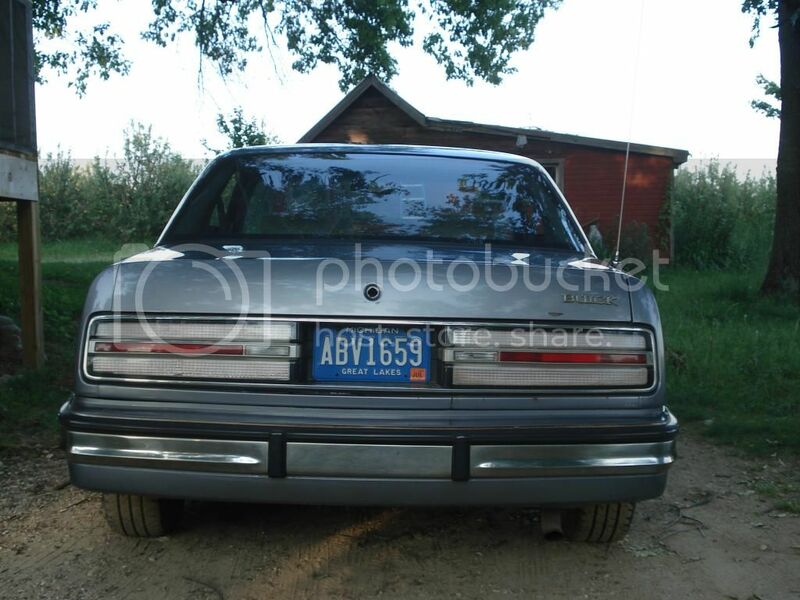 It was an option for the 2 door regal's. There's more info about them somewhere on the w-body boards but I don't think I ever found much about them. I still have the assembly somewhere actually because I thought I'd end up selling it but never did. They look amazing at night! I wish I had a picture somewhere. The rears are being converted to disc brakes. The HD 3/4 ton trucks all got a weight adjustable proportioning valve, I'm still looking into it but there should be enough adjust-ability in that valve to take up any additional bias adjustment when going to rear discs. It was leaking fluid, but looks like I may be able to rebuild it. 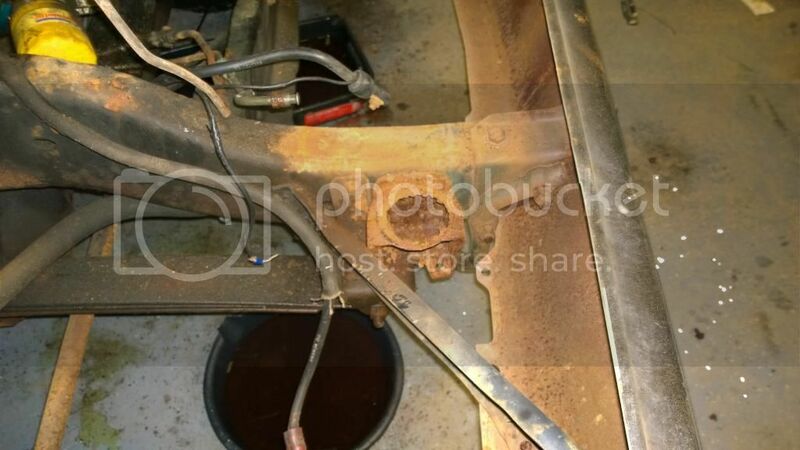 However, I have a semi-float rear end so I have to crack open the differential and remove the axle shafts for the swap, and of course inspect the rear end to make sure failure is not imminent as it has a lot of backlash. To parking brake, or not to parking brake..
As long as I've been driving it the parking brake has never worked. The cables are rusted as are the shoes. In order to fix that I'd have to replace everything. The rear parking brake calipers are also about 2x's as expensive as the standard caliper. To be street legal I think it has to have a parking brake, but I heard those calipers need to have the parking brake set every time you park otherwise they start getting soft and/or pedal travel will increase. There is a chance that the same rear calipers I used on the Bonneville will fit the brackets, they are cheaper and don't have the same 'setting the parking brake' concern. 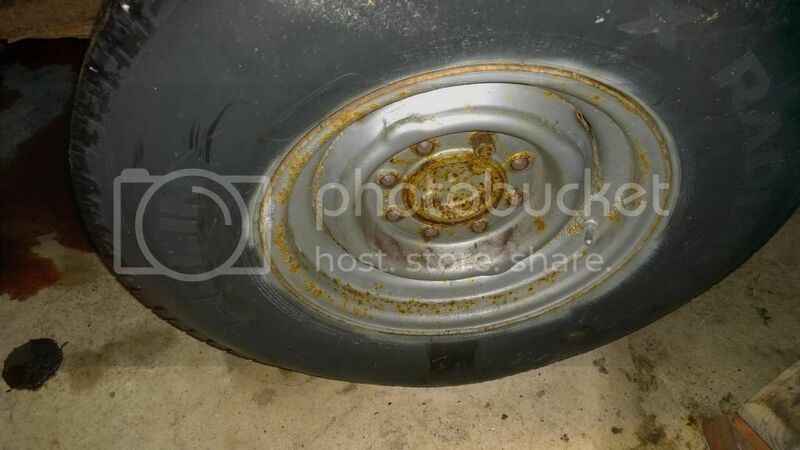 Boy that's a lot of rust. I like to think of it as a nice patina. My main focus for now is going to be cleaning up the important things, like the frame, brakes, suspension, body mounts, and get it back on the road. If you never use the parking brake, then don't bother! Or does MI do inspections? I know we all love the 3800 and N* on here, but why not a proper Chevy BBC? Engine's, parts, etc, all all plentily available, and usually pretty cheap and should be more or less drop in. 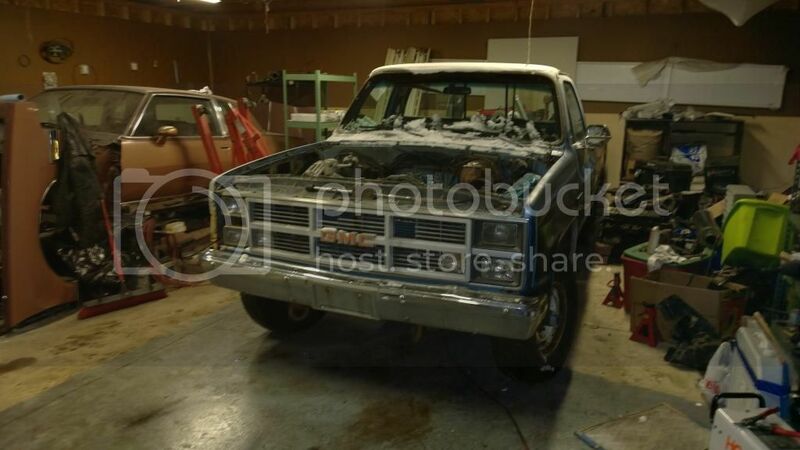 I'd be shopping junk yards for a wrecked NBS 3/4 ton Suburban with the 496 and 4L80/85E. 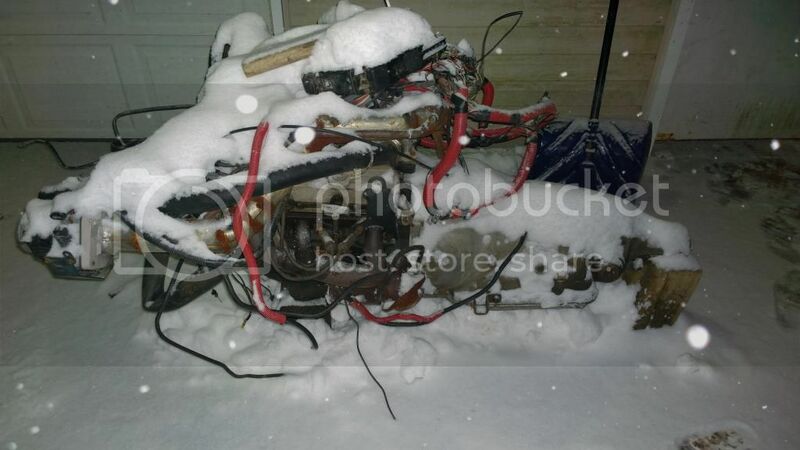 If I found a wrecked '02 with the 496 and a 14b rear, I would either swap the entire drivetrain into mine or put the body from mine on the newer frame. What are your thoughts on a ladder bar for this thing? I removed maybe a few dozen parts this weekend. Cab will need a lot of work. 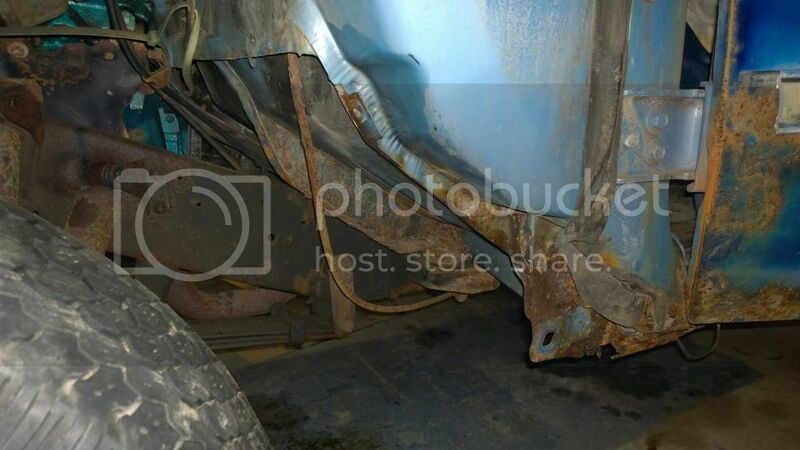 I'll be getting new fender liners, a new radiator support, and probably a non-dented fender. I'm somewhat surprised that the grille was still attached, the plastic has been sun bleached and is brittle and was only being held on by 4 of the screws. I'll also need new body mounts. Let's have some fun! I'm disassembling everything that I'm going after here first. 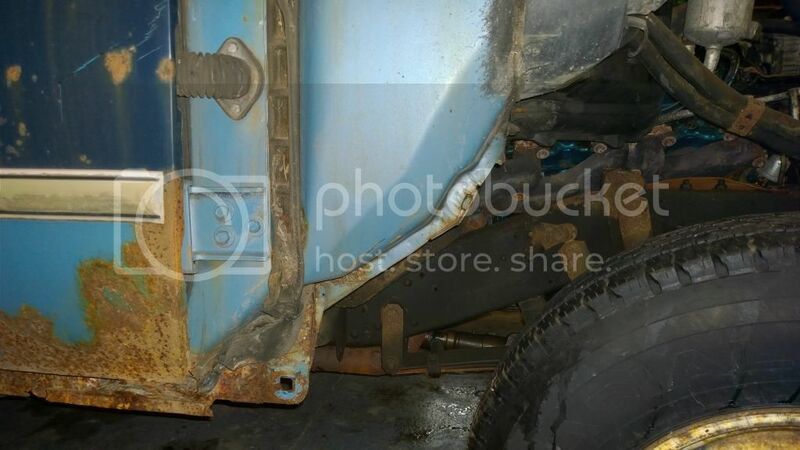 Fuel tanks, rear brakes, exhaust, front end. I'll repair what I can, replace everything else. And the engine is out! So I've discovered that the standard fuel injection sending unit from our H-body cars is nearly a direct fit for the sending units from the truck. The advantage here is that I don't have to figure out how to add wires to a sending unit and re-seal it, I can trim a tab off an H-body sending unit and drop it in. All I need now is a tank selector valve that can switch the fuel pump as well. Once again, I find myself faced with a dilemma. 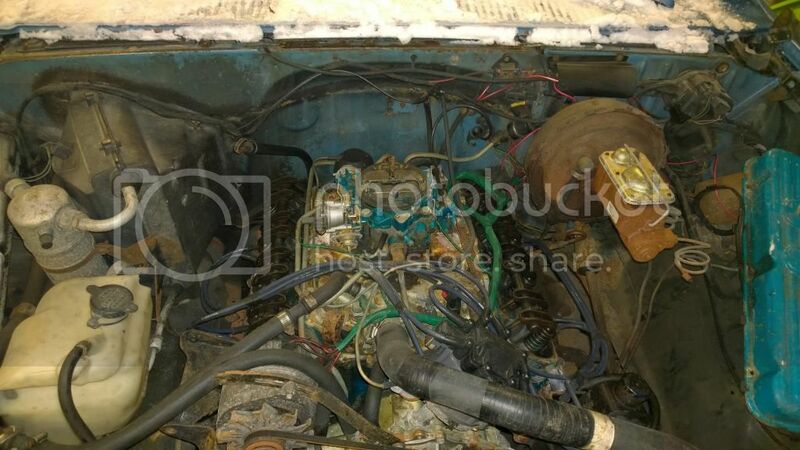 I wanted to find a set of RWD headers for this 3.8, but I can't find anything. Of course, there are some Holden sets out there, in Australia. So that leaves me with keeping the set of ugly manifolds on, modifying a set of series 2 headers, building my own, or LG3 top swap and run the '86-'87 turbo 3.8 headers.